Comments: We get a look at the biggest and baddest Haint in the woods. He is illustrated as a big dark creature. Emmy now though is not afraid of him. Emmy is illustrated as a cute simple girl. One who has power though. Her attitude lets you know that. As you read this story you can just feel it in the background. Horror lives here. Emmy is clearly the star of this comic but it is nice to see other characters featured as well. Not a lot happens this issue. We get a look back at the big dark creature, the Haint. He seems more than just a Haint though. 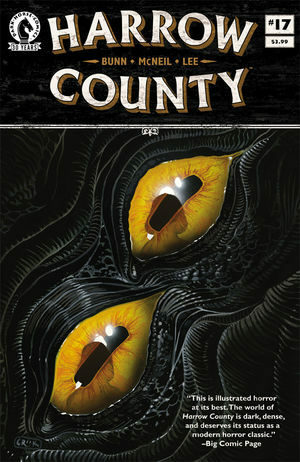 “Tales of Harrow County: The Tithe” This is one great short tale of terror. Be careful what you take cause it just might get taken back.